Fishponds built across streams can greatly affect their functioning, especially through loss of ecological continuity but also changes in water availability and trophic resources. Yet, their consequences on communities and stream functioning remain largely understudied. We investigated effects of fishpond dams on the trophic ecology of macroinvertebrate communities in temporary low-order streams using C and N stable isotopes. Food resources and macroinvertebrates were sampled in one upstream and one downstream site of two temporary streams, one stream without (reference stream) versus one with a fishpond (impacted stream) and used for isotopic analyses. Results suggested moderate effects of fishponds on the upstream tributaries. 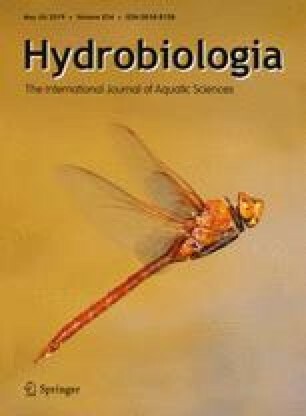 In contrast, at the downstream impacted site, ten times higher macroinvertebrate biomass and modifications in the trophic niches were recorded, likely due to changes in resource availability/quality and dam-related hydrology. By modifying the food sources as well as water fluxes, fishpond dams tend to alter macroinvertebrate communities but also shift the trophic dynamics downstream. This assessment stresses the need for exploring their impacts on food webs and nutrient fluxes at larger downstream distances to better understand their effects before drawing conclusions in regard to their management. The online version of this article ( https://doi.org/10.1007/s10750-019-3920-0) contains supplementary material, which is available to authorized users. The authors gratefully acknowledge the financial support for this project by the ‘Agence de l’Eau Rhin-Meuse’ and the ‘Zone Atelier Moselle’. We sincerely thank E. Arce, P. Chaud, B. Le Carrer and Y. Namokel for their field and laboratory work, as well as the fish farmers, the ‘Office National des Forêts’ for providing us with access permits for sampling. We are also extremely grateful to the INRA of Champenoux for allowing us to use the laboratory facilities and conduct the stable isotope analysis at PTEF OC 081 from the UMR 1137 and UR 1138. The PTEF facility is supported by the French National Research Agency through the Laboratory of Excellence ARBRE (ANR-11-LABX-0002-01). We also want to thank the three anonymous reviewers and the associate editor, M. M. Sánchez-Montoya, who help to improve this final manuscript.